Women artists as a group are seriously under-represented in the Ambient Music genre. 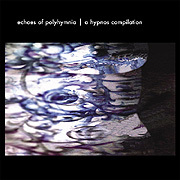 The Hypnos label rectifies this situation somewhat with the release of Echoes of Polyhymnia (67'55"), an anthology presenting ten works by ten innovative and imaginative female sound designers. Although each track seems drawn from a different background, this CD sparkles with a common tender energy. Among those contributing to this effort is Sara Ayers and her piece "There Was No More Time". Within its sustaining space are heard layers of voices and synthesizer pads, all rising, shifting and receding in dramatic confluence. Kristin Miltner realizes a restless extended soundscape full of distinctive vocal textures and curious metallic tinged drones. Her "Slew Wave" is a rare work that is as sophisticated as it is lovely. "Wave-Particle Duality" by Gydja creates an odd quietude. Its breathing synth chords conjure up a magical atmosphere as intermittent spacey drips, beeps and chirps keep the listener from drifting away. On "She Forgot, She Dreamed" Lena Griffin continues her foray into the dark and reverberant tones she elicits from a viola and digital signal processing. The remaining tracks provide equally wonderful experiences. From sound collage and tone poem to pulsing sequencer rides and breathy celestial choirs, Echoes of Polyhymnia moves easily from the experimental and academic, to the sentimental and spiritual - while keeping a cohesive vision and common destination. Hopefully more women will venture into this genre - bringing with them their inherent qualities and distinctive abilities. Ambient Music can only benefit from more diversity among its artists.